↑ Wee, Lea (13 December 2012). "Running gave him second wind". Straits Times (Singapore): p. 24. ↑ "New Delhi Marathon runner Fauja Singh to retire after one last run". 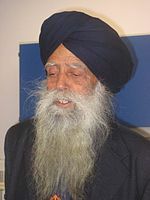 24 January 2013. http://www.hindustantimes.com/India-news/NewDelhi/Marathon-runner-Fauja-Singh-to-retire-after-one-last-run/Article1-999041.aspx. ↑ 4.0 4.1 4.2 "Life begins at 90". بی بی سی. a. http://news.bbc.co.uk/sport2/hi/funny_old_game/4631111.stm. Retrieved on نومبر 15، 2012. ↑ "M100 Indian sets 8 world records in succession؟ Check ID first". MastersTrack.com. اکتوبر 2011. http://masterstrack.com/2011/10/20285/. Retrieved on نومبر 15، 2012. ↑ "At 93، Adidas Marathon man Fauja runs with god as partner". خبر. انڈین ایکسپریسّ. اپریل 19، 2004. http://www.indianexpress.com/oldStory/45350/. Retrieved on نومبر 15، 2012. ↑ "اولمپک مشال لے کے دوڑیا فوجا سنگھ -جیکاریاں نال گونجیا لندن". SatSamundronPaar.com. اگست 11، 2012. http://satsamundropaar.com/story/440. Retrieved on نومبر 15، 2012. ↑ 8.0 8.1 "Another marathon milestone for centenarian". انگریزی خبر. د ٹربیون. اکتوبر 18، 2011. http://www.tribuneindia.com/2011/20111018/main6.htm. Retrieved on نومبر 15، 2012. ↑ 9.0 9.1 "Fauja Singh، 100-Year-Old Marathon Runner، Won't Get His Record". HuffingtonPost.ca. اکتوبر 24، 2011. http://www.huffingtonpost.ca/blackberry/p.html؟id=1028410. Retrieved on نومبر 15، 2012. ↑ "Oldest marathon runner announced retirement". انگریزی خبر. بی بی سی. اپریل 20، 2012. http://bbc.co.uk/news/uk-england-london-17784505. Retrieved on نومبر 15، 2012. ↑ 11.0 11.1 "فوجا سنگھ ولوں فل میراتھن نوں الوداع". خبر. پنجابی ٹربیون. اپریل 23، 2012. http://punjabitribuneonline.com/2012/04/٪E0٪A8٪AB٪E0٪A9٪8C٪E0٪A8٪9C٪E0٪A8٪BE-٪E0٪A8٪B8٪E0٪A8٪BF٪E0٪A9٪B0٪E0٪A8٪98-٪E0٪A8٪B5٪E0٪A9٪B1٪E0٪A8٪B2٪E0٪A9٪8B٪E0٪A8٪82-٪E0٪A8٪AB٪E0٪A9٪81٪E0٪A9٪B1٪E0٪A8٪B2-٪E0٪A8٪AE٪E0٪A9٪88٪E0٪A8٪B0٪E0٪A8٪BE/. Retrieved on نومبر 15، 2012.